One player makes this gloomy assessment as the MMO nears the release of its major revamp titled "Final Fantasy XIV: A Realm Reborn" despite efforts by developer Square Enix to clamp down on real-money trading (RMT). When asked by a new player looking to get into FFXIV how the game is faring, forum user sirdayne said RMT bots in the game are partly responsiblefor the now-punishingly high prices of materials and gear, which makes gear acquisition for those just starting out more painful than it should be. "Inflation is rampant. It costs 1/3 of market price to make your own goods. With leves awarding about 1-2k per leve (at my current level) and people typically charging anywhere from 25k-100k [FFXIV Gil] per gear item, gear acquisition is frustrating," he said. "This is may be attributed to RMT running leves at Camp Skull Valley. 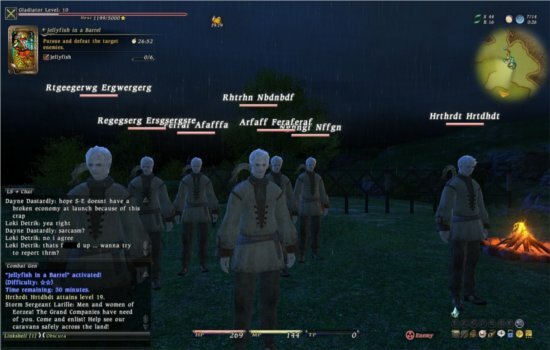 They make a bunch of clones and have a PL do all the levequest work for them while they sit in camp soaking up Gil," he added, posting a screenshot of what has become a typical scene at the grinding spot. "I witnessed and reported this and I hope that S-E takes the time to thoroughly check all this activity on their servers and remove that Gil from circulation before A Realm Reborn launches," sirdayne said, acknowledging after that Square Enix has been addressing the issue of RMT leve farming for months now. In an English-translated post in late June, Square Enix said that it is aware of RMT operations stemming from its high-paying leves. "STF team and the operation team acknowledge RMT's doing the faction leve 'Wanted: Godwin Goodgoat' repeatedly at Cedarwood, this month we dealt with over 700 accounts," said Square Enix, referring to the Special Task Force (STF) appointed to respond to illegal in-game activity such as the use of third-party software or the selling of FFXIV Gil through RMT. "However the current situation is where they create a new character and repeat; we also see them collecting faction credit at places such as Skull Valley. From the players' point of view it may look as if nothing is being done but please understand the STF will continue to investigate and address this issue," Square Enix added. Square Enix community team member Bethany "Rukkirii" Stout confirmed the bannings, saying: "We banned 700 accounts last week, but as you know they keep coming back. In addition to ongoing STF efforts, we will be setting up countermeasures system wise as we head towards version 2.0." The banning efforts which seemed to have begun in June coincide with the slight dip in FFXIV Gil pricesin recent months, dropping to as low as $9 per 900K FFXIV Gil around mid-June. Prices have slowly climbed back up, breaching the $10 per 900K mark this month. We believe this shouldn't be taken as a sign that Square Enix is giving RMT sellers a slack; instead, it is more probably a sign of rising demand due to the impending launch of A Realm Reborn. As we have pointed out beforein the example of EVE Online ISK, virtual currency prices tend to increase during new expansion releases, and although Square Enix insists that A Realm Reborn is anything but an expansion, the sheer scope of content coming in with the revamp qualifies it as one.